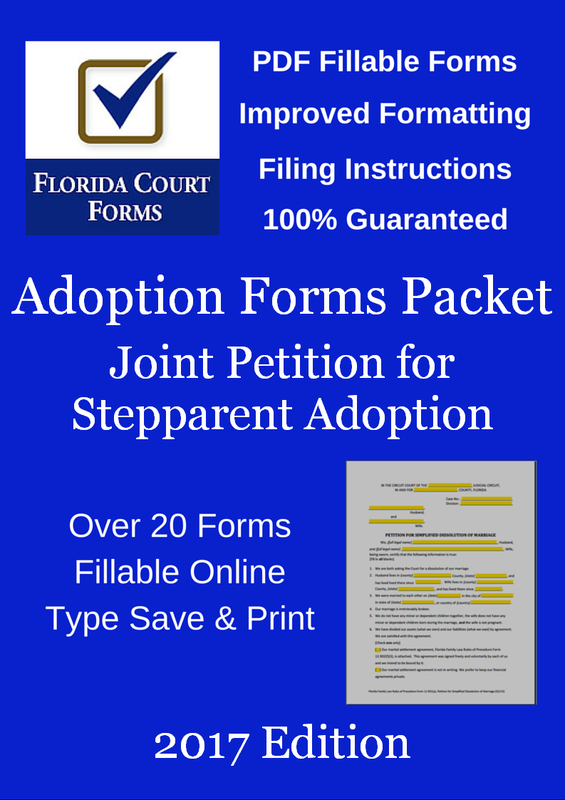 Are you looking for stepparent adoption forms in Florida? We explain the process to file the Joint Petition for Adoption by Stepparent with links to all the supporting forms. The process for the Petition for Adoption of Adult by Stepparent is similar and they share many of the same supporting forms. For an in depth article on the adult stepchild adoption process see our page titled Stepparent Adoption Adult Children. So you can follow along, go ahead and download the Florida Supreme Court Approved Family Law Form 12.981(b)(1) from the state court's website. To purchase our premium PDF fillable adoption form shown below, just click on the image ($3.50). 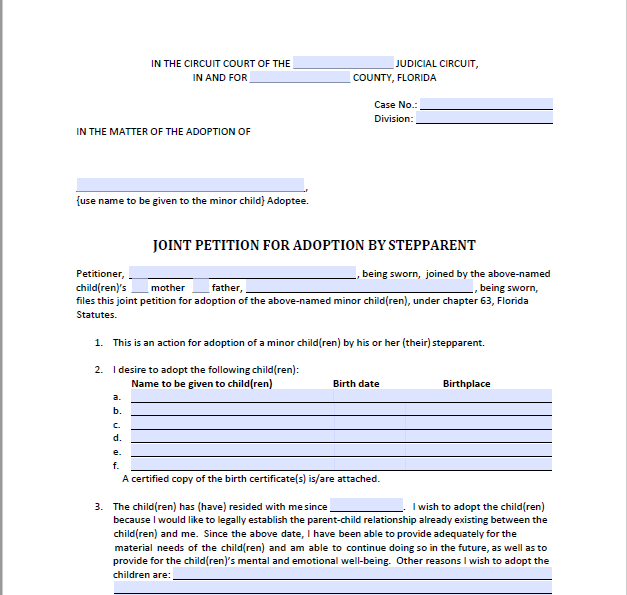 This is the stepparent adoption form used when a stepparent is adopting their spouse’s minor child or children in Florida. The name to be given to the child or children after the adoption should be used in the heading of the joint stepparent adoption petition. The stepparent is the petitioner, because he or she is the one who is asking the court for legal action. Both the stepparent and their spouse must sign this petition. You must attach all necessary consents or acknowledgments that apply to your case. 1. the mother of the minor. • in the case of an unmarried biological father, he has acknowledged in writing, signed in the presence of a competent witness, that he is the father of the minor, and has filed such acknowledgment with the Office of Vital Statistics of the Department of Health within the required time-frames. For your stepparent adoption case to proceed, you must have the written consent of the other birth parent and the child if the child is over 12 years old. The court may choose not to require consent to an adoption in some circumstances. For more information about situations where consent may not be required, see section 63.064, Florida Statutes. Determining whether someone’s consent is required may be a complicated issue and you may wish to consult an attorney. § 63.062 - Persons required to consent to adoption; affidavit of nonpaternity; waiver of venue. § 63.063 - Responsibility of parents for actions; fraud or misrepresentation; contesting termination of parental rights and adoption. § 63.064 - Persons whose consent to an adoption may be waived. § 63.082 - Execution of consent to adoption or affidavit of nonpaternity; family social and medical history; revocation of consent. Section 63.054, Florida Statutes, requires that in each adoption proceeding the Florida Putative Father Registry be searched. You will need an order from the judge to do this, which you can request by filing a Motion for Search of the Putative Father Registry, Form 12.981(a)(6). You may also be required to supply the order granting the search of the Florida Putative Father Registry, Form 12.981(a)(7), for the judge to sign. After completing these stepparent adoption forms, you and your spouse must sign them before a notary public or deputy clerk. You should then file the original stepparent adoption petition and 1 copy with the clerk of the circuit court in the county where the minor resides unless the court changes the venue. You must also file all the required supporting forms. This stepparent adoption forms packet is suitable for a Stepparent Adoption with or without all required consents. Over 20 PDF fillable forms including all required and procedural forms. All forms are PDF format with fillable form fields. Unlimited saving & editing. All forms are PDF format with fillable form fields with unlimited saving & editing. Before proceeding, you should read General Information for Self-Represented Litigants for more information on stepparent adoption forms. See Chapter 63, Florida Statutes, and Florida Family Law Rule 12.200(a)(2) Case Management for Adoption Proceedings for further information. If any person whose consent is required is deceased, a certified copy of the death certificate. Certified copy(s) of the child(ren)’s birth certificate(s). Visit the Florida Bureau of Vital Statistics website to order certified Florida death and birth certificates. If all persons required to consent have consented and the stepparent adoption forms, consents/affidavits of nonpaternity have been filed with the court, the hearing may be held immediately. If not, notice of the stepparent adoption hearing must be given as provided by the Rules of Civil Procedure. If you know where the other birth parent lives, you should use personal service. In order to use constructive service you will need to complete and submit to the court an Affidavit of Diligent Search, Florida Supreme Court Approved Family Law Form 12.981(a)(4). For more information about personal and constructive service, you should refer to the General Information for Self-Represented Litigants and the instructions to Florida Family Law Rules of Procedure Form 12.910(a) and Form 12.913(b) and Florida Supreme Court Approved Family Law Form 12.913(a)(2). However, the law regarding constructive service is very complex and you may wish to consult an attorney regarding that issue. When you have filed all of the required stepparent adoption forms and met the requirements as outlined above, you are ready to set a hearing on your joint stepparent adoption petition. You should check with the clerk, family law intake staff, or judicial assistant to see if you need to bring a final judgment Form 12.981(b)(2) with you to the hearing. If so, you should type or print the heading, including the circuit, county case number, division, and the children’s names, and leave the rest blank for the judge to complete at your hearing. You should decide how many certified copies of the final judgment you will need and be prepared to obtain them after the hearing. Need to Amend a Florida Birth Certificate? The Florida Department of Health and the Office of Vital Statistics handles amendments to Florida Birth Certificates. See the following FDOH publications for the latest information. The file will be sealed after the final hearing, and then it will take an order from a judge to open the file and obtain a copy of the final judgment. AN ADOPTIVE STEPPARENT WILL CONTINUE TO HAVE PARENTAL RIGHTS, INCLUDING VISITATION AND CUSTODY, WHERE APPROPRIATE, IN THE EVENT OF A LATER DIVORCE, AND MAY BE LIABLE FOR CHILD SUPPORT IN THE EVENT OF A LATER DIVORCE. YOU COULD BE LIABLE IN LITIGATION FOR THE ACTIONS OF THE ADOPTEE(S). THIS ADOPTION MAY ALSO AFFECT THE ADOPTEE’S INHERITANCE. Our documents service can have all your stepparent adoption documents professionally prepared after a brief interview with our trained Florida Legal Document Specialists.